WELCOME RESTAURANT OWNERS AND OTHER MAKERS OF FRIED FOODS! If you are restaurant owner and you make French fries, fried chicken, fried fish, or other fried foods, this website is for you. This website is also for makers of potato or corn chips, donuts, and any other foods that are fried. We do not cover cooking oils used in the home. FryTest.com, LLC is a 100% independent company. We are not owned, associated with, or controlled by any cooking oil manufacturer, food company, or distributor. We exist solely to provide unbiased information about the different zero trans fat cooking oils and other zero trans fat products on the market today. We provide the information to you absolutely free of charge. We do not sell any of the products on this website. We provide you with contact information so that you can contact the manufacturers or distributors directly. To ensure that we are providing you with the best information possible, we held a contest. We contracted with Texas A&M University to conduct a zero trans fat cooking oil contest. Texas A&M has one of the most prestigious and respected oils and fats programs in North America. Check the Contest page for more information. If you are looking for a zero trans fat cooking oil, be sure to check the List of Zero TF Oils & Results page. This is the single best source of information on the Internet today about available zero trans fat cooking oils. The term "zero trans fat " on this website means an oil that contains less than 0.5 grams of trans fat per serving. This is the U.S. Food and Drug Administration definition. 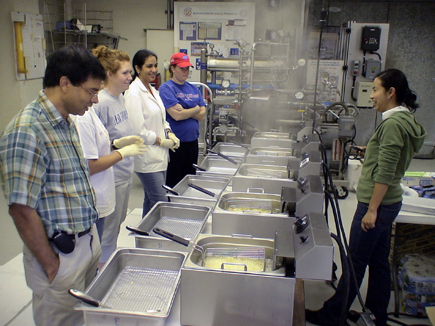 Texas A&M has completed the testing of ten oils in the FryTest.com zero trans fat cooking oil contest. The results are posted on the List of Oils & Results page. Click on the image below to see pictures of the oil contest.